B Papadakis is running the Boston Marathon® because she and her family are grateful for the care the hospital gave her triplets. 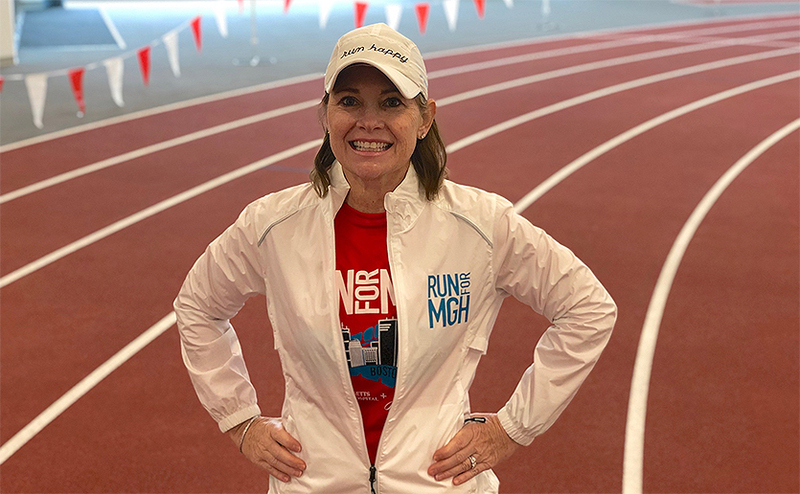 B Papadakis is running the Boston Marathon® for Massachusetts General Hospital because she and her family want to give back to the hospital that provided medical care that changed their lives. Twenty years ago, B was pregnant with triplets. Within the first 24 hours, a NICU nurse suspected Lena, one of the identical twins, might have a serious medical issue. Doctors at another hospital had given B and her husband, Manny, devastating news: Tests showed their identical twins had a medical condition and would not survive long after birth. The best chance was to continue the pregnancy with one child. B, an identical twin herself, could not accept this diagnosis. She sought a second opinion on her ultrasound, and then was referred to Michael Greene, MD, a Mass General obstetrician and gynecologist who specializes in high-risk pregnancies. Within hours of B contacting Dr. Greene’s office, he personally called to reassure her and took over her care. At week 32, Alexandra, Joanna and Lena were born. Alexandra and Joanna each weighed only a few pounds, but were doing well. But within the first 24 hours, a nurse in the Patty Ribakoff Neonatal Intensive Care Unit (NICU) at MassGeneral Hospital for Children (MGHfC) suspected Lena, one of the identical twins, might have a serious medical issue. Doctors diagnosed Lena with a Type C TE fistula — an abnormal connection between her esophagus and trachea and other esophagus problems, meaning she could not eat without surgery. The family split their time between their New Hampshire home where Alexandra and Joanna stayed and the NICU. They were waiting for Lena to grow big enough for surgery, then to recover. One of B’s most treasured moments from that difficult two months was when she arrived at the NICU and found pediatric surgeon Dan Ryan, MD, with Lena. From left, sisters Lena, Joanna and Alexandra Papadakis. Lena has undergone more than 30 surgeries at Mass General and Mass Eye and Ear. Early on, surgeons reconstructed Lena’s trachea and prompted it to grow, using a piece of her own rib. In one year alone, as a preschooler, Lena was hospitalized for pneumonia about 20 times. Twice after surgeries, Lena was placed in medically induced comas to give her esophagus and trachea time to heal. “Most of Lena’s trachea and her ability to swallow has been ‘man-made’ by this amazing team that has followed her since her birth,” B says. Hospital providers, like pediatric nurse, Elise Drew, RN, gave our family the best medical care and support, B says. “Every time, I couldn’t even make it through a day and my husband and I were sobbing, Elise was the person who kept us together,” she remembers. After age 10, Lena’s health improved. Now, at 20, she is followed by T. Bernard Kinane, MD, chief of the MGHfC pediatric pulmonary unit. Today, Lena is a sophomore at Boston University, taking pre-med courses. B, 52, says running for the Mass General Emergency Response team will be her second Boston Marathon to honor Lena’s caregivers. She ran for the Mass Eye and Ear team in 2017. Lena is in awe of her mother’s training efforts, which she does while working full-time as vice president and global controller of Synscort, a big data software company in Massachusetts. In 2018, B broke her ankle and got a concussion during training. This year, B developed severe plantar fasciitis to the point she could not walk without pain, only two months before race day. After working with doctors and introducing cross-training, B got back to training. She is determined to be at the marathon start line and do the race, even if she has to walk part of it. When B started running marathons, Lena was a teenager. Her mother’s commitment inspired her to publicly talk about her past health problems. Please consider supporting B Papadakis and the other dedicated runners raising funds for Emergency Response. For more information, please contact us. John Hancock’s partnership with the Mass General Marathon Program continues to be a strong and unwavering source of key funding for hospital programs. For 22 years, John Hancock has provided Mass General runners with invitational entries for the Boston Marathon®, as well as an opportunity to fundraise on behalf of the hospital. John Hancock provides Mass General runners with bib numbers for the Boston Marathon®. Mass General’s Pediatric Cancer Team has raised more than $14.4 million since it was formed in 1998. Funds raised by this team – the hospital’s longest running — support research and child-life activities for children with cancer. In 2014, the Mass General Marathon Program expanded when awarded 40 additional entries to create the Emergency Response Team. These entries recognized the lifesaving response of hospital employees following the 2013 Boston Marathon® bombing. In the last five years, the ER Team has raised more than $1.9 million to advance the hospital’s emergency preparedness and disaster medicine efforts. Thanks to John Hancock’s support, Mass General has received 20 additional entries for the 2019 Boston Marathon®. Runners wearing them will raise funds to benefit the Home Base program. This Mass General-Boston Red Sox Foundation program helps veterans, active service members and their families deal with the invisible wounds of war. Additionally, through the Run for MGH Team, runners who acquired their own entries for the Boston Marathon® raise funds for various Mass General programs that are near and dear to their hearts. Programs being represented by 2019 runners include: Caring for a Cure, Cystic Fibrosis, Down Syndrome, the Lurie Center for Autism and the Mootha Lab. To learn more about the Mass General Boston Marathon® Program, please visit our website.